How to Advertise on Facebook? Learn How to create an Ad! HomeBlogFacebookHow to Advertise on Facebook? Advertising on Facebook can provide your Business with a lot of Exposure to the stable customer. In the whole world, more than two billion people are using Facebook. These users are highly engaged with the posted content on the network. To advertise on Facebook you have to run Ads campaign over the Facebook business page. If you have a Facebook business page then, start creating your own Ad and if you don’t have any then log in to facebook business page now. 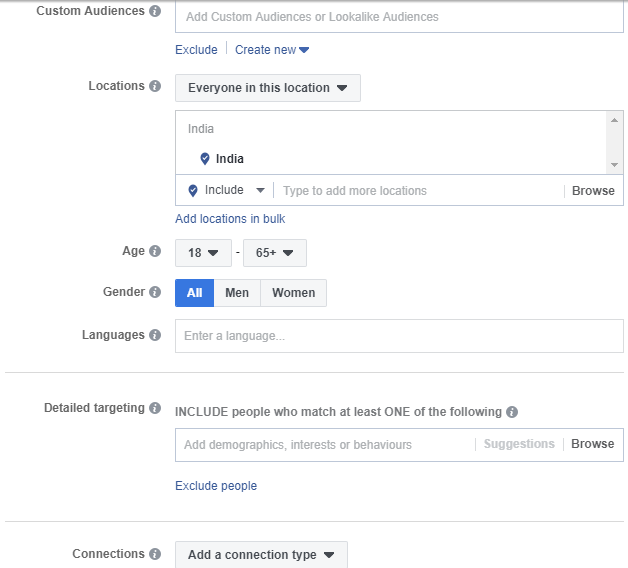 Facebook has a huge global audience which is combined with the ability to target in your advertisement by demographics(age), location(country/city), interests and behaviors. You can allow Facebook users to access the exact ads according to their needs. And Facebook provides the best ROI(Return On Investment) the best platform for social media. Now, let’s start with creating and placing an Ad over the Facebook. How to create an Ads? You can Advertise on Facebook by creating an Ad on Ad manager or Facebook Business developed by Facebook. After logging into your Facebook Account, click on the ∇ icon and go to “create Ads”. an “Ads Manager” page will open up where you are provided with a various platform to create an Ads according to your choice and budget. You need to choose your Marketing objective from the given option provided. The objective should depend on the goal of creating an Ad. You have expectations for an Ad to benefit your Business so, be very confident about your choice. You need to pay according to the cost model for your Ads so, choose the Objective of your Ads by keeping a profitable budget in your mind. You need to set up your Ad account before creating an Ad. In this option provided you need to choose the currency, country and time and click on continue. 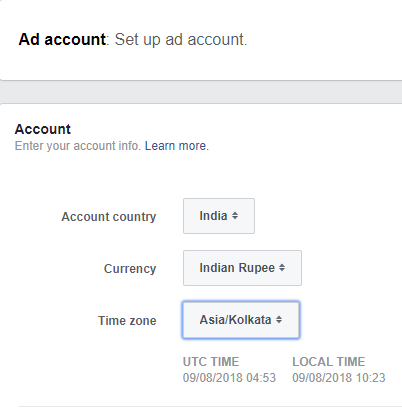 Budget and Schedule for your Ads. < You can create any Facebook Page or promote any Facebook existing page in the given above page tab. < The placement of an Ad depends on Automatic placement or you can edit them too. 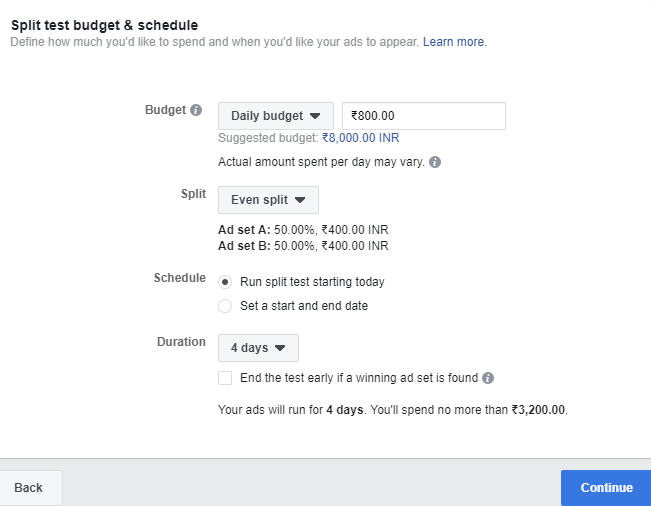 < In budget and scheduling, if you are running a normal Ad then, it will ask either to start from today or ask for the start and end date. If you chose to have a split test Ad then, you might have the following options. Here, you can set the Budget, split Schedule, and Duration for your Ad. The data shown in an image is default setting and you can change it according to your choice. After you are done with your choices you can submit your choice. 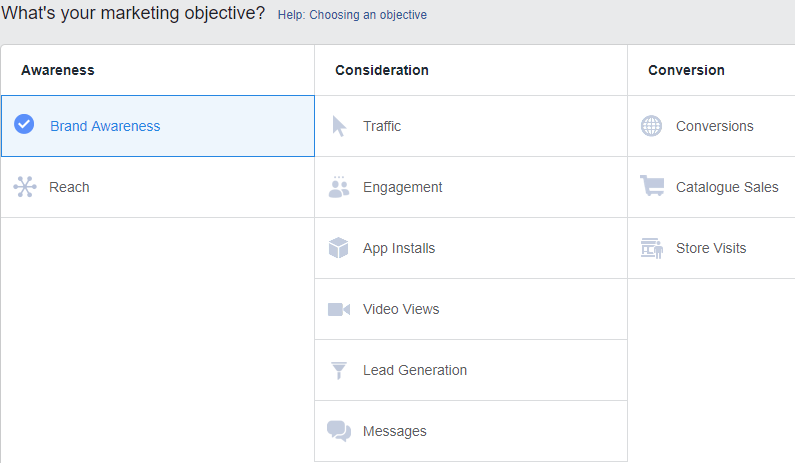 You need to define the Facebook page to identify your Ad. The media will let your Ad be displayed on Desktop or mobile phone. The Ad manager provides the formats to display your Ads i.e. Carousel, single image, single video, slideshow and many more as shown in an image. Once you are done with the Ad creation scroll down and click on confirm. Doing this will save your ads and will get visible to an audience on the specific scheduled date. You will get notified by a confirmation mail after your Ad has been created.